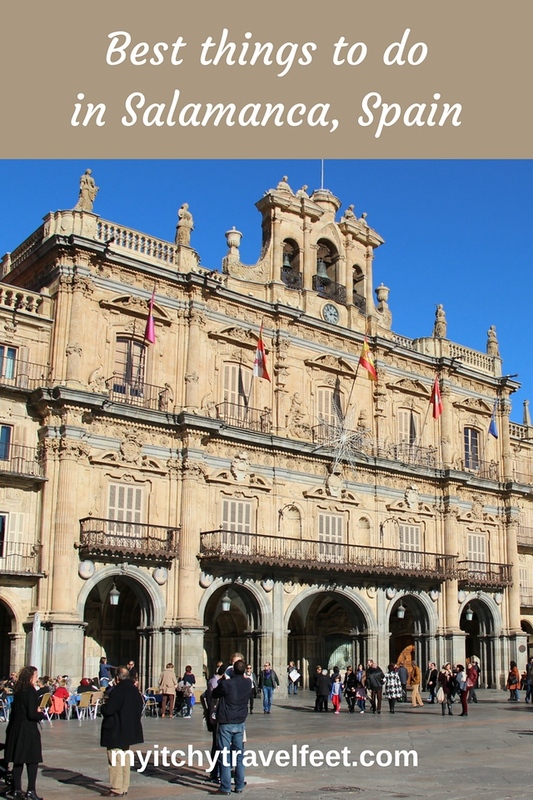 Let me be the first to warn those planning to visit Salamanca: Like many other Spanish cities, a trip to Salamanca means taking in a lot of history and culture. As one of Spain’s most beloved towns and a UNESCO World Heritage Site, Salamanca is an exciting trip back in time to the Iberian Peninsula’s most regal and enlightened age. Of course, with centuries of history, you’ll want to have a list of things to do in Salamanca. However, consider yourself warned again: that list will be long and let’s just say, um, diverse. Of course, to get started, you’ll want to see the most popular highlights such as the University of Salamanca, founded in 1134. Then, you’ll want to make time for the majestic cathedrals, both old and new. 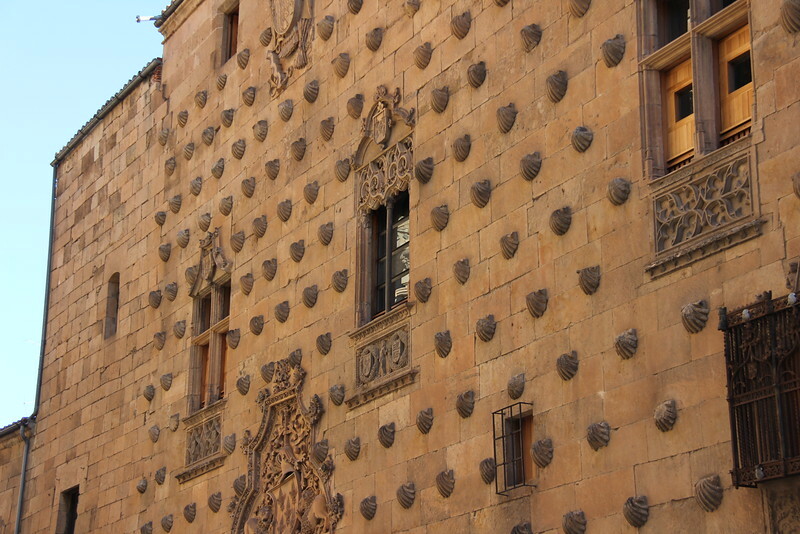 The House of Shells (La Casa de Conchas) is a Salamanca must-see. As is the Plaza Mayor, said to be one of Spain’s most beautiful plazas. Then, you’ll want to stop into the Church of St Martin to see if the cantankerous man with a twinkle in his eye will let you see the hidden Roman Arch. Finally, you’ll want to search for the hidden frog and the astronaut and the dragon licking an ice cream. Got all that? Let’s get started. Just about 120 miles from Madrid, Salamanca is a great destination for a long weekend away from the capital. Salamanca’s Old City was declared a UNESCO World Heritage Site in 1988 and it’s quite easy to see why. Two thousand years of history can be found walking throughout “Salmantica”. 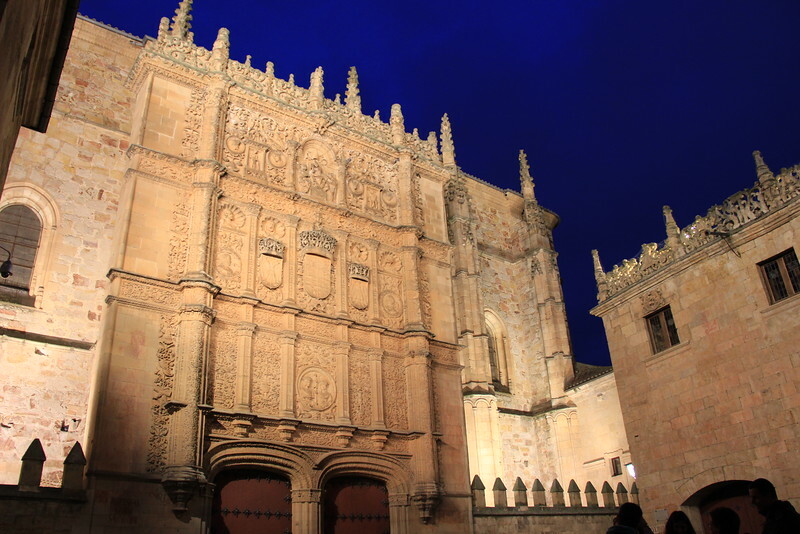 The oldest sites in Salamanca are the Old Cathedral and San Marcos Church, both of which go back to the 12th century. The city’s original cathedral was started in the 12th century and completed in the 14th century. Almost two centuries later, the city decided they needed a new cathedral to accommodate the increasing number of students who came to study here. Once completed, however, the locals decided that tearing down the old cathedral would be a shame, so they decided to keep both imposing structures. The new cathedral has quite a few surprises waiting for visitors. Now, if you decide to visit the cathedrals, make sure you take a good look at the arched entryway of the new cathedral. To the left, you’ll find some curious artwork carved into the arch around the door, a floating astronaut and a dragon-like creature eating an ice-cream. Looking for a place to stay in Salamanca? 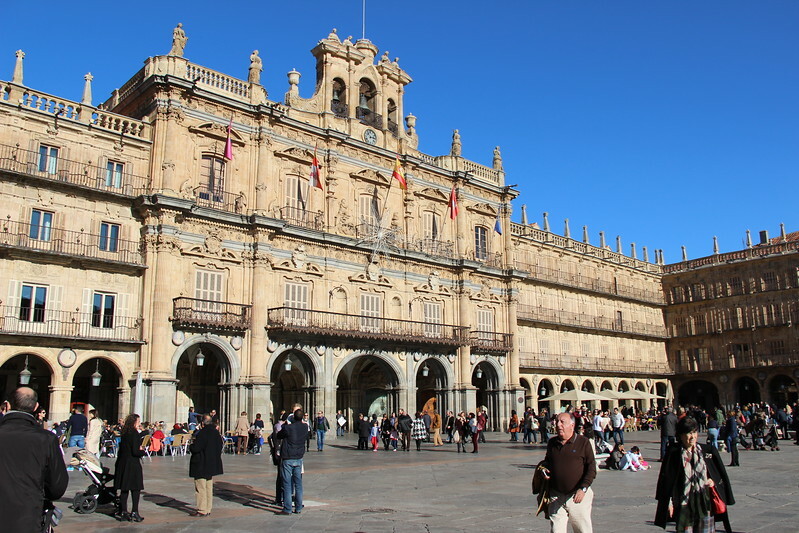 Start your for hotels in Salamanca with us. Well, although it would be lovely to think that some incredibly inspired artist from the 15th or 16th century had a vision of a future manned visit to space, it’s simply not the case. Apparently, in the early 1990s when the cathedral was undergoing some renovations, a creative artisan decided to”sign” his work on the doorway with a symbol of an astronaut. The cheeky old artisian has probably had many laughs over how much attention the astronaut has gotten over the years. However, to tell you the truth, nobody has ever been able to explain the dragon eating ice cream to me. 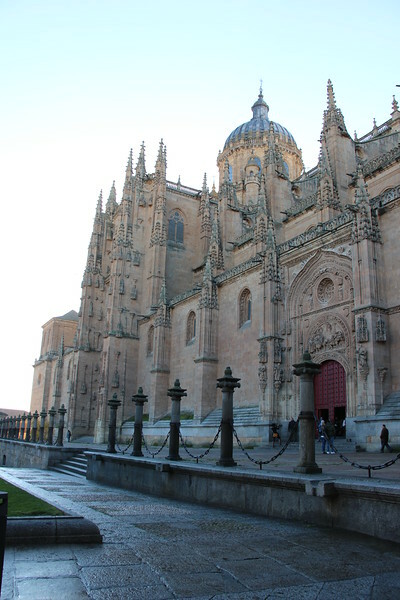 Although the cathedrals are the city’s most visual landmarks, Salamanca is known as a university town. Founded in 1134, The University of Salamanca is the oldest in Spain and with 30,000 students today, remains as one of the top universities in Spain and Europe. A visit to Salamanca would not be complete without taking a tour of the university and getting to know some of its well-known alumni. Hernán Cortés took classes at Salamanca as did Miguel de Cervantes, although neither finished their studies at the university. Although he didn’t study there, its notable to mention that Christopher Columbus lobbied the King and Queen to support his voyage to the Indies in the University’s Council of Geographers. Ornate facade makes it almost impossible to find the frog, by the way. As you tour the university’s exterior, you’re sure to see a large group of people outside the Escuelas Menores building. The elaborate facade made up of Renaissance arcades is decorated with many notable figures that pay homage to the university’s long history. However, nobody is really looking at the beautiful figures because they are too busy trying to find “the frog”. It’s a long story, but according to one local lore (and there are many), if students can find the itsy-bitsy frog, they’ll have academic success. And no, I’m not going to tell you where it is. That’s for me to know and you to find out. Casa de las Conchas is certainly one of the most peculiar designs in the city. Built in the late 15th century, the Shell House or Casa de las Conchas, is decorated with over 300 scallop shells. It’s a curious building that was built for the marriage of a knight in the Order of Santiago de Compostela and professor of the university, Rodrigo Arias de Maldonado. Today, the large house contains a public library on the interior. I recommend taking a quick look inside because there is a beautiful courtyard right at the entrance. In a small square adjacent to the Plaza Mayor, you’ll see the small Romanesque church of San Martín. Go inside and ooh and aah over the humble interior. As you enter, though, look to the left. There’s a gate at the back of the pews that leads to an original Romanesque portal that is in incredibly intact condition. It’s a must see if you can swing it. However, there is no ticket to buy as apparently the site is only open to those who meet the approval of the man we came to call “The Gate Keeper”. 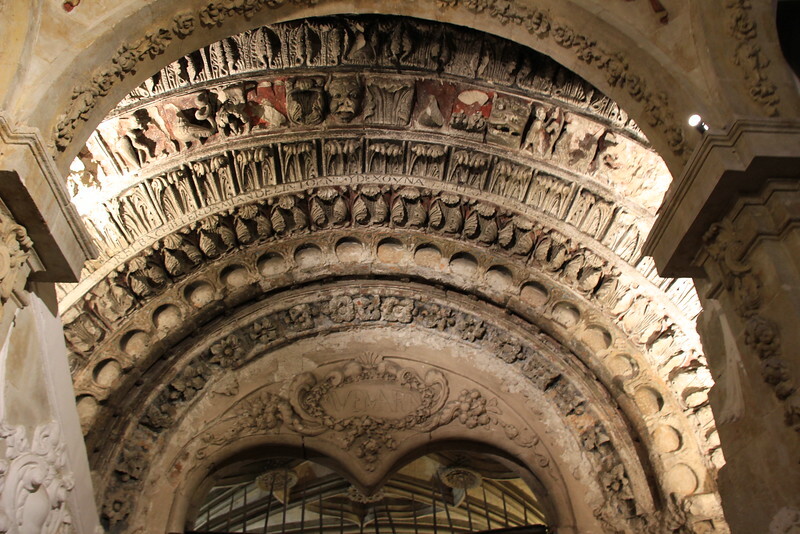 Beautiful Romanesque portal in the San Martin church. Finally, he led us into the small gated room and showed us the arch, which, as you can see in the photo, is really quite impressive. Are you inspired to plan a Spanish adventure? Check out our Spain Travel Planner to get started! So, yes, in addition to its abundant charm, the beautiful Spanish city has many peculiarities and finding them hidden among the historic sites in the old town makes for an incredibly unique visit and a great way to spend time in Salamanca, Spain. What would you add to our list of things to do in Salamanca? Join the conversation at the My Itchy Travel Feet page on Facebook or send us an email to ask a question or share your experience.